With the United Kingdom’s scheduled March 2019 departure from the European Union around the corner, policymakers and the public alike are grappling with the reality that if an exit deal is not quickly finalized, a hard Brexit may await. 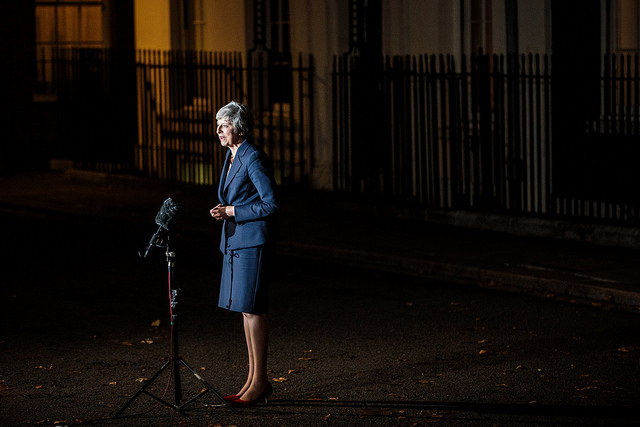 UK Prime Minister Theresa May announced in mid-November—more than two years after the June 2016 referendum on EU membership—that her government had agreed with EU negotiators on the terms of a divorce deal. But the dust has not yet settled. The UK Parliament must still approve the agreement, and amid high-profile resignations, ultimatums, and a historic finding that May’s government was in contempt of Parliament, this is far from certain. Though just one of countless issues on the table, questions of citizens’ rights have hit home for many people on both sides of the Channel. For the 1.3 million Brits living abroad in Europe and the 3.8 million EU nationals who call the United Kingdom home, the uncertainty over what rights they will have come next March has been extremely troubling. Source: United Nations Department of Economic and Social Affairs, Population Division “Trends in International Migrant Stock: The 2017 Revision" (United Nations database, POP/DB/MIG/Stock/Rev.2017). Available online. Vote to Leave or to Be Left Behind? Since this time last year, provisions about citizens’ rights agreed in the February and March 2018 UK-EU drafts made it into the final agreement largely unscathed. This includes more generous EU rules for family members seeking to join a British resident of an EU country than is the case for relatives of other non-EU citizens, and the maintenance of existing reciprocal social-security arrangements. Yet this progress could easily fall by the wayside if the agreement fails to clear the necessary political hurdles. And even if a deal is finalized and Britons living in another Member State retain many of their rights there, they will lose one of the major benefits of EU citizenship—the freedom to move to and work in other countries in the bloc with few strings attached. Some UK citizens with work, family, or residence ties to a Member State have sought to gain that country’s citizenship, in part to secure these more extensive rights. But restrictions on dual citizenship in some countries, including Spain, have created obstacles; others, including the Netherlands, are reviewing restrictions on dual citizenship in order to smooth the Brexit process for both their British residents and for their nationals in the United Kingdom. Separately, the UK government has piloted a settled status process for EU-national residents, which would provide some level of security even if the agreement falls through. However, an official statement issued in early December indicates that in a no-deal scenario, the protections on offer would be less generous than those linked to an EU-UK agreement. EU citizens would, for example, only qualify for settled status if they are living in the country before March 29, 2019, rather than the end of 2020, since there would be no transition period. While most Member States have been waiting for a deal to be finalized before moving ahead on issues concerning their British residents, some have kicked contingency planning for both “deal” or “no-deal” scenarios into high gear. In September, the German government published a “Brexit Transition Act” that would go into effect if an EU-UK deal comes through, allowing eligible Britons to apply for dual nationality during the transition period—something usually only permitted for citizens of other EU countries. France, on the other hand, has planned for how to regularize the status of its British residents and regulate their residence and work rights in the event of a no-deal Brexit. In the end, finalized deal or not, the United Kingdom and the EU-27 countries face a long road ahead as Britain’s 46-year relationship with the bloc evolves. Many countries must still tackle questions of which documents to accept from applicants for a new post-Brexit residence status as well as what to do with people who don’t apply in time. And if the reports of glitches in the UK settled-status pilot are any indicator, much work remains to be done if this is to be a smooth process for the mobile populations caught up in Brexit.